Like many cooks I fear, I do have a habit of lighting upon something that looks very interesting, buying it in a fit of enthusiasm and then forgetting all about it until the fridge thins out and reveals all. This usually coincides of course with an absence of a few days, and returning home after all the shops have shut! Thus it was yesterday, and my fresh supplies were running low. Low enough to reveal though some delicious, albeit unusual combinations to try. I had been given a few days earlier a Yellow Patty Pan squash and my enthused purchase had been a wonderful globular Sicilian Aubergine, resplendent in pinkish purple and white. To this I thought I had little enough to add, but some rooting about found a few organic supplies still unconsumed. A carrot, some fresh ginger, a solitary green bean from the allotment, some smoked garlic and a tin of chopped Italian tomatoes along with a packet of Mozzarella. I waste very little of my produce purchases, in fact anything in the way of off-cuts is always destined for the compost anyway so you could say what goes around comes around, as the late, great Bob Marley said! Anyway, enough prattling and on to the important stuff, FOOD! 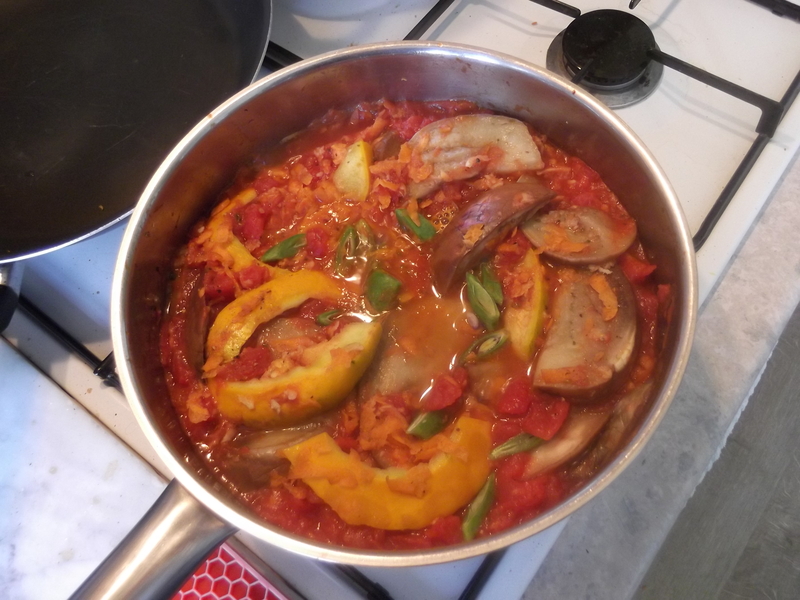 One Sicilian Aubergine, topped and then quartered longways and then into further 10 mm slices; one Patty Pan Squash, topped and tailed, then cut in half across ways and the seeds scooped out, then into 20 mm slices; one carrot; 2″ fresh ginger peeled; one green runner bean, cut into 20 mm diagonal chunks; smoked garlic, 2 fat cloves, just crushed; 1 x 400 ml tin Italian chopped tomatoes; A 275 g packet of organic Mozzarella; Olive Oil; dried Oregano; 400 g of broad ribbon pasta like Pappardelle or similar, sea salt. Medium heat your oil in a high sided fry pan, then add the aubergine slices turning to coat with oil (you may need to add a little oil to the later slices). Keep the heat down to prevent charring and sprinkle the aubergines slices liberally with oregano turning to ensure even distribution. 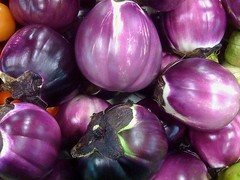 It is the addition of oregano to aubergine dishes that gives them that Taste of Sicily! Then add your Patty Pan and stir in gently. Allow them to get acquainted at a low temperature while you open the tomatoes, pour yourself a glass of wine, etc., etc…………………. When the mix has nicely softened add the chopped tomatoes and the crushed garlic, stir and simmer. Then using the fairly coarse side to your grater (I bought an OXO one recently and found it great, although a danger to unwary fingertips!) grate first the ginger in and stir well, then the carrot and stir that well in too. Finally add your green bean! Allow to simmer ’til the bean is al dente. With your pasta water (I always put a little salt and olive oil in too) at a rolling boil, add your Pappardelle and ease into the water. While it is cooking to the famous Al Dente stage, drain the brine from your Mozzarella packet and tear the soft cheese up, scattering it over your simmering dish. Drain the pasta well and serve with it surrounding the gloriously coloured dish. If you, and I suspect you won’t, have any left it makes an equally delicious cold Antipasti for lunch the next day. My fellow Gastronomers will remember that I extolled the virtues of Sun-blushed Tomatoes in my Focaccia Recipe, but I know they aren’t easy to find, even in relatively good Delis. That gave me a mission! I asked around several good cooks of my acquaintance and one finally turned up trumps with this simple recipe. 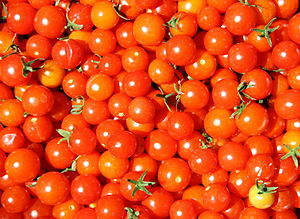 About 30 small RIPE cherry tomatoes [A good tip is to look out for reduced price punnets near their sell-by dates in Supermarkets or better still at the end of the day in your local market. These have usually just got to the fully ripe state. Don’t buy ‘ Cherry Tomatoes on the Vine’, they are ridiculously expensive, and what do the others grow on for heavens sake!! ]; 2 level tsp sea salt; 1/2 level tsp demerara sugar; 1 heaped tsp dried oregano [lemon thyme works well too]; 3 generous tbsp good Olive Oil. Pre-heat the oven to 200-220 degrees C, 180-190 if a fan oven. Halve the tomatoes and set them out close together, cut face uppermost, on a baking tray. With the Olive Oil in a small bowl mix in the salt and sugar. When dissolved add the dried oregano. Carefully pour the mixture onto the tomato halves ensuring that each has its share. Carefully place the tray in the upper part of the oven, check it’s up to temperature, then turn it off! Leave the tomatoes in there all day, or prepare them in the evening and leave overnight if you anticipate needing the oven during the day. When they are cooled you can [if you think they’ll last that long!!] put them in clean jam or olive jars and drizzle over them another tbsp of your Olive Oil for each jar. A good idea is to make a nice ‘Rustic’ tag and tie it on to the jar, then you’ve the perfect thing to take to any ‘Foodie’ friend the next time you’re invited there for lunch or supper! A quick, simple, cheap, and most importantly, delicious meal for 4. If you have a local butcher where you can find fresh rabbit, use them. You probably know that rabbits were always hung outside butchers with at least one paw still on, and that this was because anatomically rabbits are almost indistinguishable from cats…….. Plus supermarket rabbit is generally sourced from China…….. Why buy something of doubtful quality that has been sent thousands of miles instead of supporting local shops? 14 oz Pappardelle pasta [rippled edged ribbon-like pasta which is wonderful for holding all the wonderful sauce!] You can use Tagliatelle if you must, but try to find it instead – and you’ll never eat Tagliatelle again! 1 lb minced Rabbit, preferably organic. You are very unlikely to find this is the supermarket but if you’ve cultivated your friendly local butcher [if not, why not?] he will at least clean and section it for you. If you cannot mince it, strip and chunk the rabbit meat into small pieces; 2 cloves of garlic, not sliced, just peeled and bashed flat! ; 1 large onion, sliced and diced; 1 or 2 sticks of celery, chopped, including the leaves; 2 rashers of unsmoked back bacon, sliced into strips; 3 glasses of dry white Italian wine, 1 for the meal, 2 for the cook…..; 3 tbsp Olive Oil, sea salt and black pepper. Heat the oil in a large casserole or thick bottomed saucepan, with a lid. Add the onion, celery and bacon and cook gently ’til the onion is softened and browning then add the garlic and cook, stirring for another 2 mins. Then add the rabbit and cook for another 5 mins. Turn the heat up briefly and add the white wine. As soon as it has boiled off, turn back to simmer. Let it cook away for 30-40 mins, keeping an eye on it, stirring regularly, and if necessary adding a little more water or stock to stop the sauce from thickening too much. Check and add a little black pepper if needed. With your pasta water at a rolling boil, add a little olive oil and sea salt, then ease in your Pappardelle. Cook ’til ‘al dente’, then drain well. Fold into your sauce and serve immediately. Focaccia Pomodoro – Buy it? – or – Bake it! If you have a lovely local Italian Deli where they bake their own and you can buy it warm and soft – Buy it and support them! If however you don’t…………….or it’s a Sunday & they’re closed and if overpriced, flabby, supermarket pap is your only alternative – Bake it yourself! It’s easy and delicious with that wonderful feeling – I made this! All it takes is a little time. Don’t ever make the mistake of using anything other than the best ingredients you can find. This doesn’t mean paying the earth. Sometimes it just means getting up off your backside and going to a market or finding a good deli. Balzano’s Deli in Cambridge for instance has wonderful Sun-blushed tomatoes and lovely Olives, and Seafood, and Prosciutto, and, and, and………….. Mix the flour, salt & thyme well together in a large mixing bowl. Crumb the oil into the mix. Stir the yeast into the warm water and mix that in too. Knead it together, not too vigorously, then cover the bowl and leave in a warm place for 2 hours. Turn on to a floured surface, lightly knead again, then flatten and spread to an oval shape and put onto a oiled baking sheet. No thinner than 1/2 “. Arrange your olives and tomatoes on the surface, and leave in that warm place for 45 mins to rise further. When risen indent all over with your fingers [my favourite bit!] and drizzle a little Olive Oil and sprinkle a little salt. Pre-heat the oven to 180 [170 if a fan oven] and bake for 35/40 mins. It’s done when golden-brown and slightly hollow sounding when tapped on the bottom. A bit like me really……………………….. Serve with a Green Salad and/or Antipasti. So many make a great fuss about Risottos. It actually takes no more time than any other hearty family dish. Does it need stirring? Yes! So what! It only needs it each time you chuck another ladleful of stock in. Use the time in between to prepare something else, the pudding, or test the wine, talk to your guests, grate the cheese, whatever! This is cooking not a boring task like scrubbing the bath! Enjoy! This is a simple recipe for a basic risotto, excellent on its own, or you can experiment and add items [mushrooms, sea-food, bottled artichoke hearts, etc] to make something even more special. Serves 4, though as usual you can increase the basic ingredients to suit the number of bodies! 1 1/2 pints stock [I make mine from organic veg cubes or powder, but, even better, if you have your own stock, chicken, fish or w.h.y. do use it as appropriate for the dish]; 1/2 a good size fennel bulb separated and finely chopped; 2 cloves of garlic, finely sliced; a medium onion finely chopped; 8 oz of proper Risotto rice; 1 good wineglass of Pino Grigio [and make it a good one, don’t cook with stuff you wouldn’t serve to your favourite guests]or a Dry Vermouth; 2 oz unsalted butter; 2 tbsp good olive oil; about 3 to 4 oz of grated Manchego [personal bias again,I just find it creamier when melted than Parmesan]; Sea salt & pepper to taste. Heat the stock ’til it has boiled then leave to stand on one side, add a pinch or two of sea salt and pepper. I put mine in a large jug with ladle at the ready in it. Use a good size, wide & deep, fry pan with a flat bottom and cover if you have one, and heat the olive oil & butter together ’til melted. Add the Fennel, Garlic and Onion and cook on a lowish heat for about 15 mins stirring occasionally so it goes translucent but NOT brown. When the mix, or soffrito, is ready add your rice and turn up the heat. The rice begins to fry, keep stirring and the rice begins to take on the oil and become somewhat translucent itself. When it does add the wine/ vermouth and stir away ’til the rice has absorbed it, enjoying the delightful smell being given off. Cook’s Perks! Then add your first ladleful of hot stock. A soon as it boils up turn down the heat to a simmer so the rice doesn’t begin to harden on the outside. Stir and push the rice around so that it begins to give off its creamy starch. Let each ladleful get absorbed before adding the next. I usually add my extra ingredients, if I’m using any, about half way through the stock jugs contents. This is plenty of time for seafood, artichokes or whatever to heat through without breaking down to mush. Continue adding stock and stirring the rice and test when you think it may be done. A slight al dente is about perfect. Don’t worry if you run out of stock before this happens, just have a little boiling water on hand to add to your jug and keep going ’til it’s done. By this time it will be creamy and smooth. Turn the heat off and sprinkle the grated Manchego over evenly. Put your cover on and leave for a couple of minutes ’til it’s melded into a delicious whole. Serve immediately, with a mixed green salad and ripe plum tomatoes, sliced. Perfecto! For this soup it is well worth seeking out from your local deli the small pasta shapes, which are intended for these dishes, Nochette, Anelli, Acini di Pepe, or Ditalini. Failing that most supermarkets these days have Orzo, the small pasta which looks like rice. To make this a quick and simple dish I would use 2 drained cans of suitable beans, in water, Flageolet, Borlotti or Cannelini are perhaps best; 2 tsp olive oil; 2 rashers of unsmoked bacon or bacon pieces, chopped small; 2 garlic cloves, finely chopped, 1 onion, finely chopped; 1 stick of celery, finely chopped [or better still if you have any 1 ‘skin’ of Fennel Bulb, finely sliced]; 1 litre of stock, homemade if you have it, or for convenience I often use organic, low salt, stock cubes or powder; 1 can organic chopped Italian tomatoes; 200 g of small pasta; freshly grated Manchego to top, which I find melts deliciously rather than floating like Parmesan ice floes tend to. Heat a large saucepan with the oil and put in the bacon, garlic, onion and celery or fennel. Saute stirring until soft and the garlic is just turning brown. Add the tomatoes, 3/4 of the stock and bring to the boil. Turn down and simmer for about 15 mins, then add your beans and simmer for a further 5 mins. Scoop out a good quantity of the beans in a sieve, and then push them through the sieve back into the soup. Bring back to the boil and add your pasta. Though small they may well take 10 mins to soften so keep stirring to prevent your soup sticking. The soup should be thick. If getting too dry add the remaining stock. Serve into soup bowls grating a little black pepper on each and adding the Manchego. Accompany with thickly sliced, warmed, ciabatta loaf and you have the perfect supper dish for a chilly day, Spring or Winter. One of my personal favourites for a quick, easy, fairly light meal. As there is no cheese used on the meal itself I often follow this with a Plum Tomato & Pak Choi [fresh & small leaves if poss. or sliced into strips] salad accompanied by a decent Brie or Neufchatel. A simple meal, which when eaten outdoors on a Summers day, with a chilled Pino Grigio and good friends makes life seem somehow brighter! 4 garlic cloves finely chopped; 2 tbsp capers rinsed; 12 oz fresh ripe tomatoes, peeled & chopped [or a can of chopped Organic Italian tomatoes]; 2 handfuls of black olives, pitted and halved; can of anchovies, oil drained and not used; 4 tbsp good quality Olive Oil, 2 oz unsalted butter; 1 dried red chilli, crushed and mixed with the capers. Fresh coriander chopped finely. 400 g Linguini. Black pepper. Heat the oil & butter in a large pan and add the drained anchovies, snipping them up with scissors. Then add the garlic. Stir until the garlic is just browning, then add the caper/chilli mix. Stir, then add the tomatoes and olives. When bubbling turn down and simmer for 20 mins, adding pepper to taste [it may, of course, be spicy enough without pepper!]. Then, with your pasta water at a rolling boil, add a little rock salt and olive oil, then your linguini. Stir once gently to ensure it doesn’t stick together and cook until ‘al dente’ Drain well and stir into your pan with the sauce. That’s why you needed a large pan! Leave to cook for a couple of minutes ’til the linguini is well coated with the sauce. Sprinkle over the chopped coriander, and serve, in the cooking pan, straight to the table. If any of your guests raise their eyebrows at this…..They’re the wrong guests!!! !